1. Preheat the oven to 190ºC, gas mark 5 and butter a medium-sized baking dish. Heat 1 tbsp of the oil in a large frying pan over a medium heat. Add the mushrooms and fry for 3–4 minutes, then remove from the pan and set aside. Add the remaining oil to the pan and fry the onion and carrot for 3–4 minutes, then add the crushed garlic and fry for another minute. 2. Add the beef mince, stirring over a medium-high heat for 3–4 minutes until browned, then add the passata and stir through the Knorr Stock Pot. 3. Cover the bottom of the baking dish with a single layer of lasagne sheets. Spoon on a layer of meat sauce, then a layer of four cheese sauce and scatter over some mushrooms. 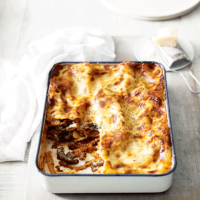 Arrange a layer of lasagne sheets on top of the mixture and repeat the layers to the top of the dish, finishing with a layer of lasagne sheets topped with the remaining cheese sauce and a sprinkling of Parmigiano Reggiano. 4. Bake for 30–35 minutes. Cover with foil towards the end, once the top is golden brown. Allow to stand for a few minutes before serving. Make individual portions of the lasagne in small pie dishes. They look really appealing and you can freeze them too. Simply defrost completely before heating through in the oven.